A world first project which sees five wind turbines with a total generating capacity of 41.5MW installed around 6.5km off the coast of Blyth. Once operational, they will generate enough low carbon electricity to power around 34,000 homes. 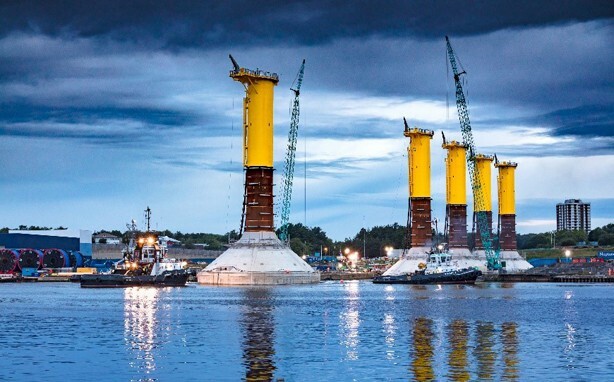 Concrete gravity-based foundations (GBFs) formed part of the project and were installed using a new ‘float and submerge’ method – the first time this method has been used for offshore wind turbines. Designed and built by Royal BAM Group and constructed in the Neptune dry dock on the Tyne over a 12 month period, the GBFs were floated down the river to the Port of Tyne and into position at sea and submerged onto the seabed to provide the support structures that act as the foundations for the installation of the wind turbines. Each GBF is made up of more than 1,800 cubic metres of concrete and weighs over 15,000 tonnes when fully installed on the seabed. The structures have a total height of around 60 metres from the base to the access platform. Working closely and sharing our expertise with international trades aided in the delivery of this project. Plant and equipment designed specifically for this project and which had never been seen before in the UK required WysePower’s know how to ensure the project kept running 24 hours a day.